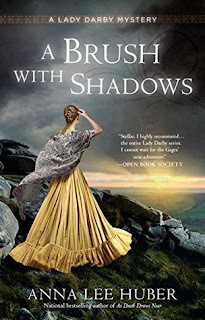 The newly married Lady Keira Darby and Sebastian Gage are still in Ireland after concluding a dangerous investigation when he is urgently summoned by his grandfather, Viscount Tavistock.Gage has not visited his family home on desolate Dartmoor in fifteen years, not since the death of his mother.But his cousin, Alfred, heir to his grandfather and Blackstone Manor, was seen walking out onto the moor and has not returned for several days. Gage has no good memories of his childhood at Blackstone, where he was bullied and bedeviled by Alfred and Alfred's brother, Rory.Gage has always been reticent about his feelings for his family, so Keira hopes that she can learn more and help heal his wounds.Keira has plenty of wounds of her own after her first disastrous and abusive marriage, but she has always had the support of her large and loving family. Gage's family on his mother's side is hardly welcoming. His aunt, the dowager, has always looked down on him because of the relative lowliness of Gage's own father's birth. The fact that his father is now a hero of the British Navy with a title of his own makes no difference. She is cold, dismissive, and often rude.The missing Alfred is by all accounts the unprincipled wastrel that Gage remembers from his boyhood. His ailing grandfather is the same cantankerous and imperious figure he always was. Oddly, he is determined to keep Alfred's disappearance a secret. Only Rory and the family butler, Hammett, appear co-operative.Strangely, there have been many unexplained disappearances and deaths in the family over the years. Could it be a family curse, and what about the reclusive "witch" living on the moor? A Brush with Shadows is a twisty tale, wrapped in family drama, set on the mysterious and dangerous Dartmoor.The relationship between Keira and Sebastian grows stronger in their understanding of each other and mutual healing after a somewhat rocky start. Thanks to First To Read for an advance copy. The opinions are my own. The Chronicles of the Warlands End.....?